Woodland Park Zoo Seattle, Washington, is home to almost 1,100 animals, birds and bugs representing nearly 300 species. Spend an entire day here discovering fun facts about critters from all over the world. The Zoo's plants are just as important, introducing visitors to the natural habitats of even the most exotic Zoo residents. When it's time for a break, there are several choices for snacks or lunch, including food carts and restaurants. Rent binoculars from guest services so you can really see all the details. Other rental equipment available include strollers, wagons, personal electric carts and wheelchairs. Jan. 1 to Apr. 30, admission is $9.25 to $13.75. May 1 to Sept. 30, admission is $12.25 to $19.95. Children 2 and under admitted free. Jan. 1 to Apr. 30, open 9:30 a.m. to 4 p.m., daily. May 1 to Sept. 30, open to 6 p.m. Closed December 25. What type of exhibits can I explore at the Zoo? Woodland Park Zoo's 92 acres is divided up into 14 different sections. Most are based on distinct bioclimates and zones on our planet. Some of these include Tropical Asia, African Savanna, and the Temperate Forest. Kids ages 8 and younger will revel in the indoor play space, Zoomazium, where they can scale a mountain and climb a giant tree. For a special treat, take a ride on the historic 1918 carousel, just $2. What endangered species are at the Zoo? Conservation is one of the main missions of Woodland Park Zoo. Over 50 threatened species make their homes at the Zoo, including plants. 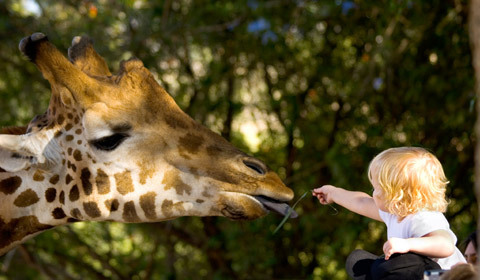 While visiting their habitats, zoo-goers will learn about each species' unique situation. Some of the Zoo's endangered mammals include the African elephant, the snow leopard and the gray wolf.